The First Lady and wife of Nigeria’s president, Aisha Buhari has returned from London where she had gone to visit her husband, President Muhammadu Buhari who has been abroad for a follow-up medical treatment since May 7. 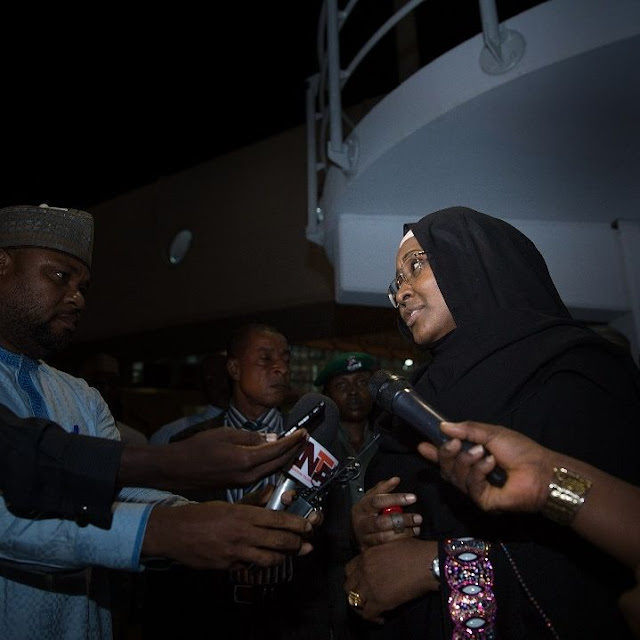 Mrs. Buhari’s spokesperson, Suleiman Haruna, in a statement said the First Lady, on arrival, conveyed the appreciation of President Buhari to Nigerians. I thank Allah for my safe trip to U.K, where I visited President @muhammadubuhari He thanks Nigerians for their constant prayers for his health and steadfastness in the face of challenges. “Mr. President thanked the acting President, Prof. Yemi Osinbajo for his loyalty and called on Nigerians to continue to support the acting President in his effort to actualise the mandate of the All Progressives Congress.” “He is soliciting for your continuous cooperation and support to the Ag. President @profosinbajo towards achieving the mandate of this administration as contained in our APC manifesto, so that we can build a very strong institution for a better future of our country Nigeria,” she said. 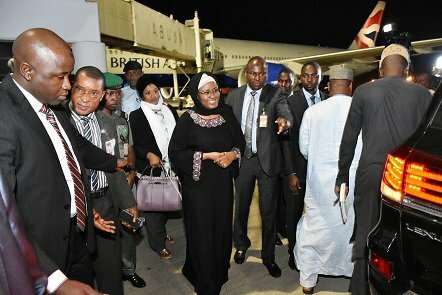 Mrs. Buhari had on May 30 traveled to the UK to spend some time with the President.